Suppose you are working on a project or maintenance schedule with thousands of activities, then you might want to make the report (layout) for the activities scheduled to start in next 3 weeks, weekly plan(weekly progress status) report, executive summary report, milestone reports, traffic-light report, and schedule analysis reports and so on. You can set the criteria that determine which activities in P6 displays in the layout or project report. With the combination of filters criteria and grouping activity column, you can make customized layouts (reports) for your team. It is good to check any existing filters when you think you need a filter so as to avoid a mess of filters in your filters list. You don’t have to start from scratch when you built a filter. 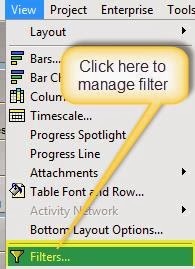 Otherwise, simply click on filter icon as show in fig below. 2) You could find predefined filters: 2 Week Lookahead, 6-Moth Lookahead, 8 Week Lookahead filters in Global Filter section. 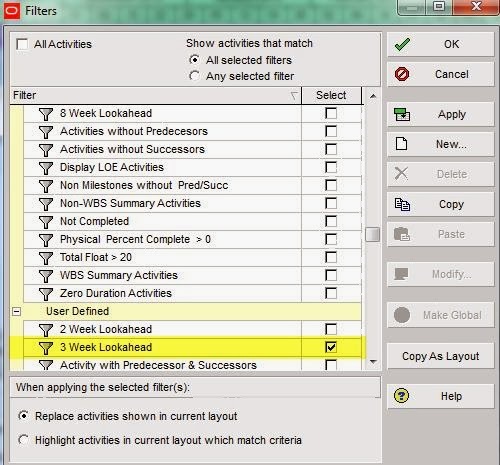 3) Then select 2 Week Lookahead Filter for instance, select Modify to see and understand filter criteria. 4) Once you click on “Modify”, you will see predefined “2 Week Lookahead Filter box as shown below. Click “Ok” if you are fine with filter criteria. 5) Use this predefined filter to display any activity planned to start in 2 week from data date (progress cut of date) and in-progress activity. For example, see below snapshot. If you have a privilege to modify Global Filter, you can see this. But don’t worry. You can copy it to see in your user defined filter list if you are not authorized to modify in Global Filter. 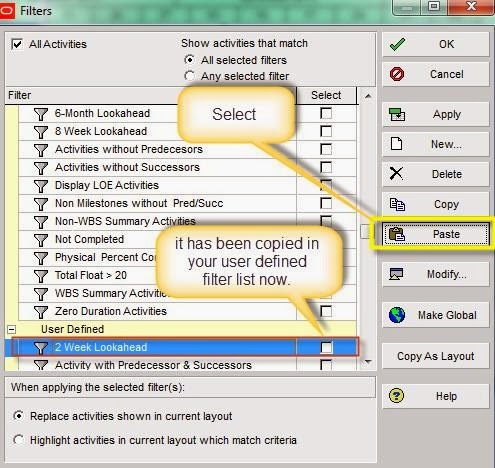 1) Then copy Global filter to your user filter. 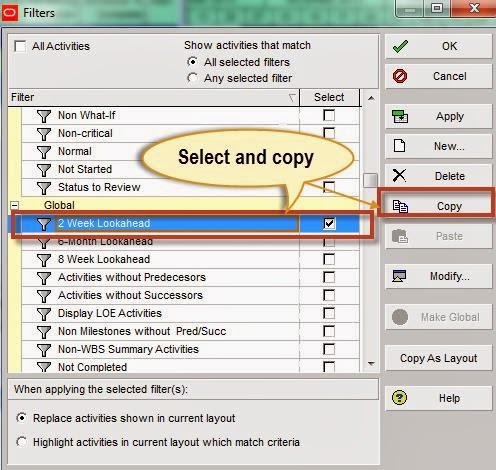 2) Select and copy one of Lookahead Filter as shown in below. 3) Select “Paste” to see that filter to your user defined filter list. 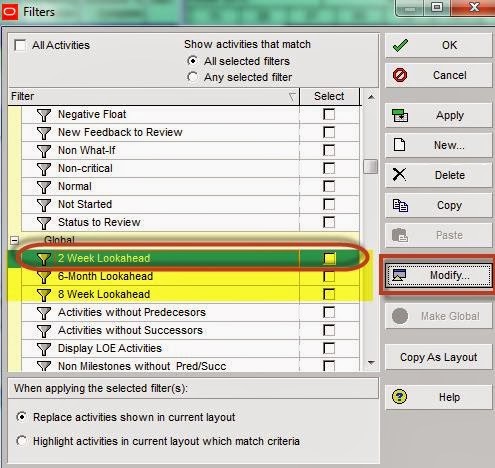 4) Select “2 Week Lookahead” Filter in User Defined filter list and Click “Modify”. Then, Filter box will appear to start modify as you need. 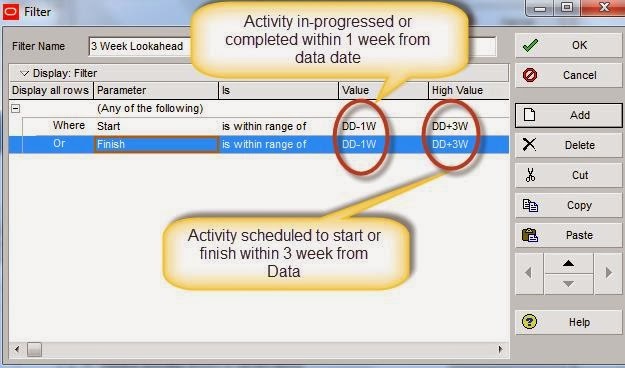 5) Enter high value parameter “DD+3W” for 3 week schedule (“DD” is for Data Date, “W” is for Week). Enter DD+5D for 5 Day Lookahead schedule (D is for Day). 1) Select an existing Lookahead filter, and then select copy and paste. 2) Once you have copied an existing filter, a new filter will appear with “_1” as a suffix to existing filter name. 3) Select that new filter with “_1”, then click on “Modify” tag and give a new filter name “3 Week Lookahead for easy reference. 4) Change the filter Parameter as below. Once you applied above filter, activity list within criteria will be displayed. For instance, see below. You might also want to search critical activities or longest path activities within 3 weeks so that you can highlight your project team to take immediate action. 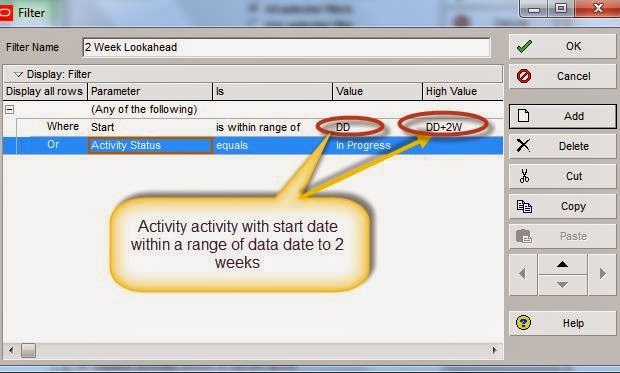 You just need to select “Critical” and 3 Week Lookahead filter to review Critical Activities within 3 Week time. 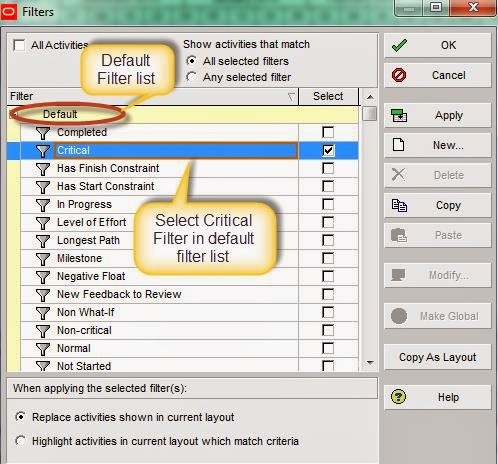 1) Select predefined filter “Critical” in Default filter list. 2) Select 3 Week Lookahead Filter in your User defined Filter list. 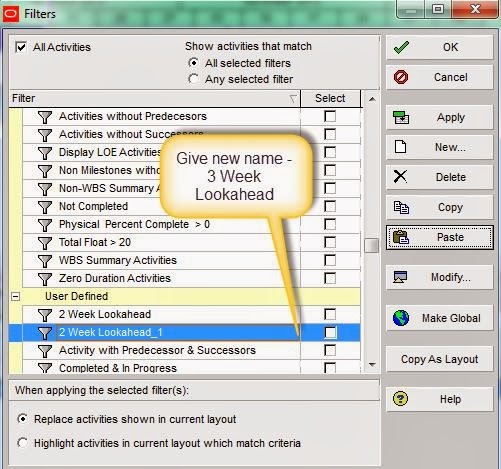 If 3 Week Lookahead Filter is not in your filter list, create a new filter. or in-progress activity in last week”. If you want to find out more about the schedule layout Filters and Reportings, go to Part 2 to learn more.